Authorities are warning Bay Area residents about a new crime trend that may target you just for owning a phone. 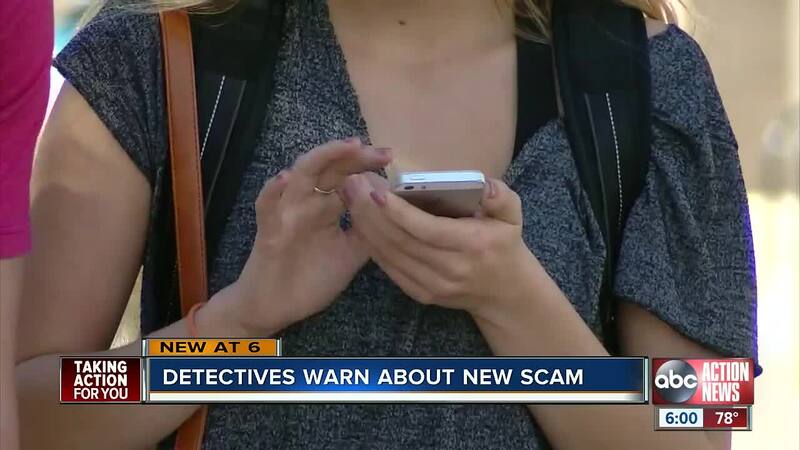 ABC Action News is uncovering the growing scam and how you can protect yourself. TAMPA, Fla. — Authorities are warning Tampa Bay area residents about a new crime trend that may target you just for owning a phone. ABC Action News is uncovering the growing scam and how you can protect yourself. Justin Kirby unboxed his brand new iPhone but Clearwater Police warn criminals are doing the same — at your expense. "That's crazy, I'd be furious if that ever happened to me," said Kirby. Investigators say one of those scammers is Keith Ramsey. According to an arrest warrant, he went to a Verizon store on Gulf to Bay Boulevard in Clearwater and tried to leave with $2,500 worth of iPhones, but not on his account. The scammer either cold calls people, or knows their number and email address — which they buy on the dark web or learn from an email phishing scam. The scammer then poses as customer service and tells their victim they want to check if they've been a victim of fraud. They tell the customer they've sent them a verification code and they'll need the customer to read that code to them. Meanwhile, the scammer has the legitimate Verizon website send the customer a verification code. Without the code, they can't access the account. Once the customer reads off the code to them it opens up a Pandora's Box. "They change the password, then they can change all the functions in the account," said Clearwater Detective Tim Downes. He's the Economic Crime Supervisor. Now with access to the master account, the scammer can add their own names without the victim knowing. They can even turn off notifications that would alert a customer to a change. At the store, the scammer can use their own identification to request adding a line and leave the store after just paying the taxes on the new phone. The price of the phone is charged to the victim's account. "I'll definitely check on my accounts for sure now. I've been with Verizon for years and years and this is the first I've heard about it was today," said Kirby. Clearwater Police has seen at least two cases in the past few days. In both cases, it involved Verizon and in both cases, it was the stores that were the ones to catch on to the identity theft. Detective Downes would not go into detail as to what alerted the stores for security reasons. He did, however, indicate they noticed very recent changes to the accounts. Downes believes we'll soon be seeing this new scam everywhere. "They will keep going," he said. "As long as they'll be able to make money off of it they'll keep going." He wants you to take a couple of steps to prevent becoming a victim. He says check your account often for any unauthorized charges. Also, Verizon may call you but they won't ask for an authorization code. In fact, when an authorization code is texted to your phone from the legitimate website it says: "For the security of your account, Verizon will never contact you for this code." Finally, Downes suggest setting up a four-digit account pin with Verizon. This is like a two-step authentication. It's used to verify your identity when you contact Verizon by phone or chat. "If they are not asking you that and you've requested that to be asked every time. That's a problem. That's a red flag," said Downes. Clearwater PD says Verizon will not be the only communications giant targeted in this scam. If you ever get a bad feeling about a call you can hang up and contact the company directly. We reached out to Spring, AT&T and Verizon for comment. While we cannot speak to specific customer scenarios or comment on an ongoing investigation, in general, as people share more information online, instances of identity theft and identity fraud have increased. This is true not just for the wireless industry but also many other industries. As wireless devices have become more sophisticated, their value has increased significantly. According to the FCC, millions of dollars are lost each year due to subscriber fraud, which occurs when someone signs up for wireless service with fraudulently obtained customer information or false identification. Fraud and identity theft impact our customers financially, forcing them to spend considerable time and effort cleaning up their credit and identity. We recognize that the privacy and security of information is of paramount importance to our customers. Unfortunately, it’s a harsh reality that bad actors are always looking for ways to engage in fraud and identity theft. With private customer information in-hand, they defraud banks, retailers, non-profits and more. As fraudsters gather more private information from the dark web and create more authentic looking fake identification, our teams at Verizon are always working to stop these criminals who impact about 7,000 customers every month. If a Verizon customer suspects fraud for any reasons, they should immediately contact Customer Service at (800) 922-0204.